Our mission is to inspire families to reach for a higher potential. Our purpose is to create immeasurable value for the families we serve. Welcome to our warm and friendly, family-based wellness practice. At Douglasdale Family Chiropractic, our Calgary SE Chiropractors Dr. Darren Scheirman and Dr. Derrick Nolan want you to live a happy, abundant and healthy life. They are passionate about helping families express their fullest health potential. From newborns, infants and children, pregnant Mom’s, weekend warrior Dad’s, to family members of all ages, Chiropractic care can be an avenue to better health for anyone. As providers of true health care, we are confident in our ability to improve the health of every practice member that comes to our office. We do this through solutions that enhance one’s well-being based on their overall health goals. Instead of being a pain-based clinic, we want families to see that there is much more to health than just “feeling good” and that their overall life expression and functional abilities can be improved. We want to be able to provide people with the information and resources to get over any dogma, fear or unawareness that can come with the word “Chiropractic.” Our doctors will take the time to fully explain chiropractic and its incredible life-changing benefits to make sure that it is the right fit for you. In addition to providing safe and effective chiropractic care, we are pleased to offer our practice members an array of health-enhancing services. Massage therapy and focused sports therapy allow muscles to relax, decrease their tension and improve an individuals overall performance. Acupuncture increases proper circulation and clears out damaging blocks “Chi” that can interfere with your health. Orthotics are an amazing tool that optimize gait movement and allow you to walk/run/hike/stand in the least impactful and most efficient way. Nutritional counseling helps practice members make good dietary choices and lose weight through the avenues of Ideal Protein® and Metabolic Balance. If you’d like to put pain in your past and experience true health, we invite you to book an appointment with our chiropractors in Calgary, SE! We want to help you and your family members flourish and live the most optimized lives possible! ""I really enjoy going to Douglasdale Family Chiropractic as all the staff us welcoming and friendly! They take excellent care of me. I am so grateful for their excellent care and guidance. "" "I was on the fast track to the glue factory. My mobility decreasing and pain increasing. I had never been a believer in chiropractic, but I was desperate. In one month, Dr. D has been able to improve my quality of life more than any other medical professional in the last 5 years. I'm a believer now!" "Dr. Darren is a fantastic Chiropractor and personable. Chiropractic allows me to continue doing sports activities I love; as well as keeping colds and headaches away. The staff is always friendly, helpful, and a pleasure to deal with. Excellent customer service!" 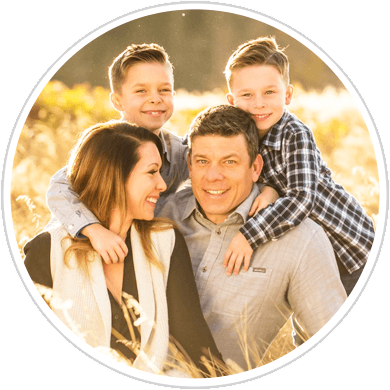 Dr. Darren has been providing excellent preventative care to my kids (age 7 and age 2.5) as well as to my husband and I for almost 2.5 years and I recommend him to EVERYONE! Chiropractic care supports every system of the body! The assistants Lindsay and Jacqueline are so authentic and genuinely care for our family."